In yesterday’s matchup between the Golden Mouthed John Chrysostom and the Harp of the Holy Spirit Ephrem of Nisibis, the bishop plucked the deacon 74% to 26% to advance to the Elate Eight. Today, we’re back up to the Biblical quadrant of the bracket as Tabitha takes on Photini. The winner of this battle will meet Martha of Bethany in what promises to be a bruising Elate Eight pairing. Yesterday, we also celebrated the release of Tim’s new book on coffee and faith, titled Holy Grounds: The Surprising Connection between Coffee and Faith – From Dancing Goats to Satan’s Drink. It makes a terrific gift for everyone on your Lent list! And, yes, even tea drinkers will find it a compelling read. Tabitha is a saint who has inspired apostles to put words into action and poets to put her actions into words. In his poem by the saint’s Greek name, “Dorcas,” George MacDonald guesses the saint may have heard Jesus speak. After all, as others have noted, the Bible describes her as a disciple. Maybe she heard Jesus tell the parable of the sheep and goats: “Truly I tell you, whatever you did for one of the least of these brothers and sisters of mine, you did for me.” Maybe that’s what inspired her to the action for which she is remembered: making robes and other clothing to help the poor and widows at Joppa. Maybe she clothed them, or maybe she sold the clothing to help support them. This is what brought Peter to Joppa — now Tel Aviv-Jaffa — after the disciples there sent several men to urge him to come and heal Tabitha. It’s also what led to a breakthrough for Jesus’ early followers, throwing open the doors of the church to welcome all, Jewish or Gentile. While in Joppa, Peter stayed with Simon the tanner, whose work would have left him smelly and often ceremonially unclean according to Jewish law. And Peter had a vision at Simon’s house in which God told him not to call anything impure that God had made clean. He then immediately had the opportunity to put what he heard into action when several men asked him to come to the home of a centurion named Cornelius, who also had a vision. This meant associating with and visiting a Gentile, which, he told them, is against Jewish law. And yet Peter went. Maybe he was inspired by Tabitha to put words into action. Later “Dorcas societies” were. They formed to provide clothing for the poor. 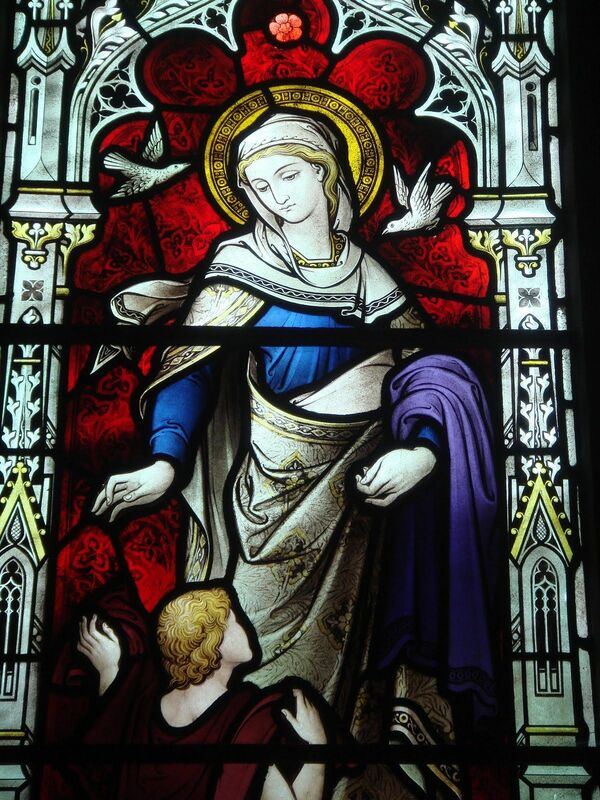 And who knows who else she continues to inspire, as she is remembered with feast days in a number of Christian traditions, depicted in stained glass windows in all kinds of churches and considered by the Orthodox Church in America to be the patron saint of tailors and seamstresses. Photini (one of many spellings of her name) encounters Jesus at the well as she is drawing water and he comes for a drink. She engages him in conversation, a testament to the boldness that would define her life as an apostle and missionary and her words that proclaimed fearlessly the Good News in Jesus. Nero tried to martyr Photini and her companions, to which she responded repeatedly with words of prayer and praise for Jesus. Nero beat them, and Photini sang psalms. He ordered his sister to have a banquet for them, hoping to tempt them with wealth and luxury. Photini’s witness converted Nero’s sister, who ordered all the gold from the banquet distributed to the poor citizens of Rome. Nero ordered them burned for seven days in a furnace. Photini sang hymns, until they walked out of the furnace, still singing hymns. Nero ordered them to drink poison. Photini offered to be first, saying, “I will drink first so you will see the power of God.” They all survived. For three years, Nero imprisoned Photini. While she was imprisoned, she turned her jail cell into a church as she preached and baptized, converting many Romans. Nero eventually threw Photini into a dry well, where she welcomed embrace of the Living Water into eternal life. In the 11th century, an epidemic causing blindness swept through Constantinople. A man named Abraamios, wept and called out for help from his failing sight. One night he saw an elderly woman, holding a candle that cast away all shadows from his dimming vision. She said to him, “Receive the light.” She directed him to a cave. Abraamios immediately ran to the place, where he found an underground chamber holding the bones of Photini. Abraamios kissed her bones and wept, and he regained his sight. The witness of Photini continues to preach to us. The church built at the Well of Jacob near modern-day Nablus is filled with icons telling the story of her encounter with Jesus. And the Monastery on Mount Athos houses her incorrupt foot and leg, while Grigoriou Monastery has a portion of her skull. Her relics and icons are venerated daily in thanksgiving for her words and her life that led many to believe in Jesus. 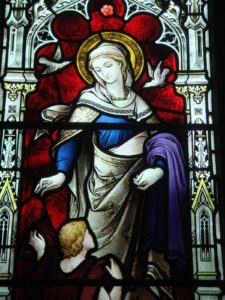 Tabitha: St. Dorcas window at All Saints’, Freshwater on the Isle of Wight. 86 Comments to "Tabitha vs. Photini"
But one’s gotta go – quite neatly. An’nias came; eye scales fell. Yet, he lost to that gal by the well. That’s why Photini vies for the Halo! Dorcas nailed the good thief to the wall. That’s why Tabitha vies for the Halo! One from John, one from Acts. Read up if you don’t believe us! While Photini converts by the score. Both have works, large and small. How they served one and all. The time to laud these two is overdue! – And Dorcas does, too! They brought many to Christ. Tab, get up! Pho, please draw! Later, you’ll testify what you saw. Both are swell. Both are great. Both should be Elate Eight. That Halo made of Gold’s crafted for you! Honey, everything’s coming up Dorcas and Pasta Girl. Everything’s Dorcas and a Roman FotoHut. Everything’s gotta be Dorcas and fancy drinks. Who’ll wear the Halo? It could end up one of these two! I love old school musicals. Thank you. Bwahaha! I really recommend singing these along with YouTube, ’cause then you get–*orchestra*!! So much fun, this one! “Pasta Girl”! I was dancing in the breakfast room. What a musical production you set off in my head—it was spectacular! Thank you for my morning laugh! “Roman Photo-Hut”–I’m sure you can hear me chuckling, giggling, snorting from wherever you are. To choose from the two who knew Christ back then. Bewitched, bothered, and bewildered am I. The tortured or one who made robes and shoes? Bewitched, bothered and bewildered, am I! Widow’s tears, on her grave. Tabitha (or Dorcas), or Pho-ti-ni? Bewitched, bothered and I so want to cry! Fantastic, Robin! I enjoyed yours even more than Michael’s today!! Good job! It’s even more so when you consider the “Bewitched”/Tabitha connection! Grea, Robin. Your song expreessed my feelings over today’s match up perfectly. Mine too! Thank you! Ever so clever! Michael, you are a musical genius. I am in awe of your wonderful lyrics. You have added so much to this year’s Lent Madness. The good seamstress that St. Peter raises. For today, Tabitha earns my praises. Another Laugh Out Loud Limerick from Mister John Cabot! God bless spell check. It’s also what lead to a breakthrough … led? And add i> and often ceremonally to the spell check Gods too. All fixed now. Life is good. I had to go back and read the original blogs for these two, so slight is their impress on my memory, as Tabitha and Photini. I voted for the Samaritan woman at the well. She had the longest conversation with Jesus of anyone in the gospel. That’s good enough for me. I don’t need all the accreted stories. If a woman got that much attention in the gospel, she must have been remarkable. Think of all the symbolism of water. Jesus needed the water she had to give to him. She provided. I certainly get that. Another hard choice. I have been dreading this matchup, because I dearly love them both. That they both have stories in the gospels speaks volumes. I ended up with Tabitha–same reasons as before: for my Dorcas sisters at work in the world, and because it’s Lent Madness–for “Bewitched”! Tabitha gets my vote as the contender whose virtue, as well as her existence, is documented in Scripture. Photini’s Gospel appearance is only as a foil for Jesus; her subsequent career is impressive but apocryphal. Those may seem to be dry criteria, but I see no reason to go beyond the historical record of a praiseworthy member of Jesus’s own circle. That Photini’s appearance was only a foil for Jesus. At least Tabitha’s name is more authentic. I can never get used to these made up names for people the biblical writers decided should remain anonymous. That phoney/phakey pheel I get from the other candidate’s name may not be the best reason for voting for Tabitha so I’ll attribute it George MacDonald. Yes, we know about Dorcas/Tabitha from Scripture. 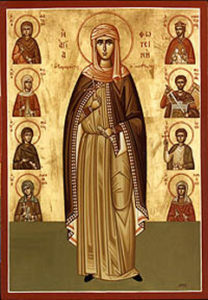 Photini” we know only as “the woman at the well,” who evidently had something about her that made Jesus tell her who and what he was, and who brought her whole village to him–nothing more. Those details alone might be enough to put her in the running, but the rest of her story detracts rather than augments. I think the Biblical spelling is pHotini. She’s definitely not neutral; I’d give her a basic 10. Whereas I’m a little more acidic than that. Yet another impossible choice. I’m voting for Photini because of her willingness to ask questions, to change, to become a witness and apostle to her people (Shocking! She a woman and a Samaritan proclaimed a Jewish Rabbi to her Samaritan village) Sometimes the strongest leadership comes from those who have been forgiven much and thus can love much. Oh what a difficult decision this morning. Both of these women are worthy of the Golden Halo. They both have so much to teach us: Photini praising Jesus and singing hymns through torture, imprisonment unto death and Tabitha serving the poor and marginalized throughout her life. Photini, Tabitha, Tabitha, Photini, eenie-meenie-minie-mo. What to do? I finally voted for Tabitha (Dorcas) in honor of all the members of all the Dorcas societies following her example. I had to go with Tabitha (aka Dorcas). I’m a volunteer at our local food bank and like to think Tabitha is our patron saint. Being a Samaritan, a person considered outcast even among the people of Israel, although worshiping the same God, I feel a call to Photini. This is where the decisions are hard. Tabitha is a great figure in the church and her own work is inspring, but the story of a woman who was an outcast and a sinner (she had five husbands and was living with a man not her husband at the time of meeting Christ), calls to me as someone who has been less than perfect in my life. I voted for Tabitha because she represents to me us ordinary Christians. No hesitation here. Photini is absolutely my favorite story in the Bible. Love that Sam Cooke quote, Carolyn! Anyone who engage Jesus in witty conversation and then evangelize so successfully has my envy and my vote. What to do, what to do? The ‘woman at the well’ is an important piece of scripture for introducing anyone to Christ, and has had loads of influence down the ages. And so have ‘Dorcas societies’–and today, the first Wednesday of the month, is our church’s quilting circle. I guess I’ll go pray and quilt! In memory of my cats Tabitha “Tabby” and Dorcas “Dory,” voting for Tabitha! Very difficult day for a quilter and a pilgrim who has been to Photini’s well/church. Oh my…..
David Dassori’s comment perfectly sums up my reason for voting for Tabitha. Thank you for expressing my feelings so well, David. My church is one of the many with Dorcas (Tabitha) in a window! So that broke the tie for me. It was really hard to choose between these women. I was all set to vote for Photini, then I thought about Tabitha. Due to the out pouring of grief at her passing, Peter was called. His thinking was changed by the visions he had in Joppa and thus the Gentiles were no longer cast into outer darkness, but welcomed as Christ’s own. Tabitha’s life and death changed the course of Christianity and Peter’s ministry for Christ. As a handspinner and maker of garments, I have a vision of the time and effort and expense Tabitha put in to make clothing for the poor and needy. This is “slow clothing” to extreme. This is love in action. My vote went to Tabitha. The Samaritan who “married” Jesus at Jacob’s well. Photini today, because the woman at the well, and helping A’s eyesight, as that’s a struggle at our house. The write-ups taught me several enlightening new details such as the important implications that Simon was a tanner. Lent Madness ignites my spiritual horizons as I realize, of course! Christian tradition often gives us clues to where the parties in the NT faith journey led. Photini is my favorite in that department. It absolutely charms me that the Early Church continued the Woman’s story with a name and tales of her character and deeds. One mystery I’ve personally encounterd: I’ve been to the church in Nablus, formerly Shechem, in the West Bank, but I never noticed icons of Photini. I do remember amazing paintings, icons with intense imagery, but nothing of Photini. At that church, over the very well Jesus received Photini’s draw, there was nothing I saw that featured her nor her name. Since “meeting” Photini here in LM ‘19, this has had me perplexed. SO hard–but aren’t they all, especially at this stage of the game? Photini–because of a long-ago meditation on what she might have felt when asked to give water to the One who gives the Water of Life. A sinner forgiven; no fossil. For she’s quite a strong woman; not docile. For a true, perfect Christian I ain’t. To me this is a similar juxtaposition of Martha who worked and Mary who listened. Both Tabitha and Martha gave witness and example through their work. Both Photini and Mary gave value in the listening: if we do not hear, how can we know what there is for us to learn. The story of the woman at the well has always been one of my favorites, for all the reasons cited in the comments preceding mine, but I just don’t buy the “sequel.” Though I’m always convinced that legends spring from kernels of truth, I’d really like to know what the primary sources are and when these sources appeared. Which sister of Nero’s is Photini supposed to have converted? He had three. On the other hand, Tabitha reaches me personally, as a widow and a seamstress. She is certainly a model for doing good with the talents we have been given. And what a beautiful write-up! The implications of Peter staying with the tanner would never have occurred to me. I am a seamstress, too, a seamstress who is losing fabric stores right and left, as one by one they continue to fold. (I guess there are fewer and fewer seamstresses out there.) But, coincidentally, I found a fabric store not too far from me yesterday, and was so happy to be in among those piled-to-the ceiling bolts of fabric and possibilities. Every color imaginable, from chartreuse to daring scarlet. Every fabric imaginable–lace, sequins, wool, batiste, satin, corduroy, chambray! And the bins of buttons, rainbows of zippers and spooled thread! It was such a welcome-home–I had to vote for Tabitha, too. I voted for her too. I also love fabric stores! Like a kid in a candy shop. The hard part is exercising restraint! A high-quality fabric store is a palace for creatives. As good as confitures. Nay, better. St. Claire is the patron saint of needleworkers. At an early age, I was contriving doll clothes. I got my first sewing machine by the age of 12. It had to be Tabitha for me. Alas…, I continue to back the Underdogs. This year’s saints are all so special, it makes voting doubly difficult!! Today was especially hard as both deserve our vote!! I hate that you pit these two women against each other!!!! I have been advocating for Ananias of Damascus literally for years, so there’s no way I’m going to vote for Photini who knocked him out of the first round. However, even if my mind had not already been made up, the opening sentence of today’s writings would have won me: Tabitha is a saint who has inspired apostles to put words into action and poets to put her actions into words. Well done, Emily. This is a hard one, Missionary or Evangelist. The church needs both and can’t survive without each of them. Need to think so more. Photini for having the faith to believe that even Nero could be converted. Yes, that is deep faith indeed. The story of Photini seems like a fictionalized image of Christian virtue – albeit a good story. There was a Samaritan woman at the well – but Photini is a later character – given a name, and martyrdom – and merged with the woman at the well for greater effect. I vote for Tabitha/Dorcas who quietly did what needed to be done, and was acknowledged early on. Photini is that she will make it harder for Martha of Bethany to win the Halo! I voted for the woman at the well. It’s a pity that so much of her story reads like mythology; however, many more famous saints are also loaded down with fabulous post-gospel tales. Setting all that aside, the woman at the well–the first to know Jesus as Messiah–is my vote for the Golden Halo. Photini, the woman at the well, is significant to me because she was a Samaritan. Samaritans were the untouchables of their day, and Jesus broke the barrier by asking for water. Photini stepped through the barrier to convert others. Tough choice again today. Tabitha is truly a saint in her care of widows and the poor and she is a valued example of living out the teachings of Jesus. But the woman at the well will always get my vote (and, I hope, the Golden Halo!). Photini ‘s story is just a bit much. Tabitha is my choice. Tabitha/Dorcas in memory of my mother and grandmother who faithfully did sewing, knitting and mending for the poor and elderly in our small town. And, I consider her the patron saint of prayer shawl knitters! My ancestors were tailors/ seamstresses; the trade they were in provided them with safe passage from the Kaiser’s army. My mother did much ‘charity sewing/quilting’ and I carry on her spirit of ‘hands to work/hearts to God’ service in a parish sewing ministry. Guess who I voted for?! Photini for the Golden Halo! I love her story. Such a strong witness for The Way. Great write up, Laurie. I taught in the senior school at Tabeetha School in Jaffa for four years – no way i can vote for anyone else. I think Photini will do better against Martha. It’ll be difficult for any of these women to beat Ignatius unless women just vote for their gender. The vast number of non-replying voters is interesting and we have no way to guess anything about their denominations, but I don’t think the majority of them are Episcopalians. And yes, I think that has a major effect on the winners. Photoni. You can’t keep a good woman down. Nero couldn’t kill her. So how can anyone vote against her? I have been a Dorcas/Tabitha fan since high school, so my vote today goes to her. My vote goes to Tabitha today. Tabitha for me today- She may be the underdog but I was very struck by the comment on how she went about quietly doing what needed to be done and thought how gentle she also must have been and how absolutely centered in on Christ she must have been in her daily life, whether it was in thought, word, or actions. How lovely for Tabitha to have inspired poetry which almost won my vote, but I have to stick with Photini because I find the story of her encounter with Jesus so moving. « Holy Grounds Book Launch!